Outside Mirabel Airport - a million years and 51 countries ago! In May of 1995 Ian and I set out on our first trip together. We had a month, a rail pass and a Let’s Go. We had no idea what we were doing, but we had plenty of enthusiasm to make up for it. We’d spent hours poring over maps and reading the guidebook. We’d planned out a route and had a calendar with destinations penciled in. We had backpacks stuffed full of WAY too many things we didn’t really need but thankfully we had young, strong backs to carry them. We were university students at the time, and living in Kingston, Ontario, Canada. There’s no international airport in Kingston, so we had to chose to leave from Toronto or Montreal. Our flight was from the old Montreal Mirabel Airport to Schiphol in Amsterdam. We were totally pumped to be heading out on our "big adventure". We arrived at the airport with LOTS of time to make the flight. At Mirabel you couldn’t just board right from the airport. Instead you had to be ferried over to your flight on a bus. When the flight finally started boarding we were on the first bus to head over to the plane. On our way over the man next to us asked us what our plans were. We told him we’d be flying on to Italy and planned to wind our way back up to Amsterdam over the next month. He told us that he’d been our age the first time he’d gone to Europe, too. 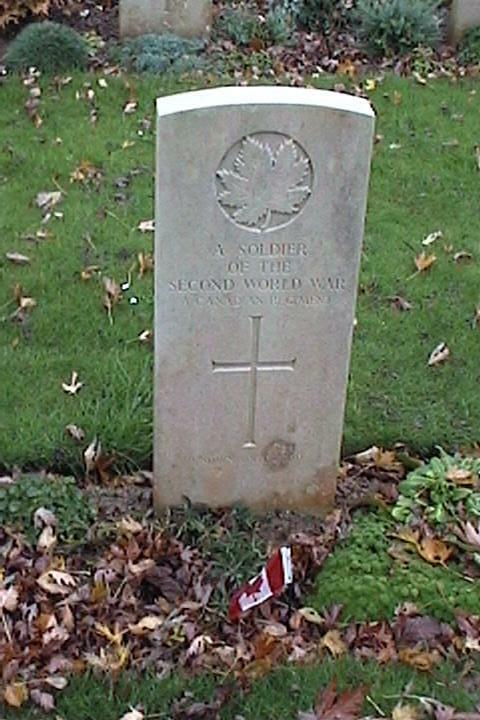 Gravestone in the Canadian Cemetery at Beny-Sur-Mer-Reviers. The bus was full. It was full of men. Older men. It was the 50th anniversary of the liberation of Europe and the flight was full of Canadian veterans returning to be honored for their brave role in changing the course of world history. And the bus wasn’t nearly as full as it should have been.